One of my favorite appetizers at a local restaurant is smoked steak nachos. 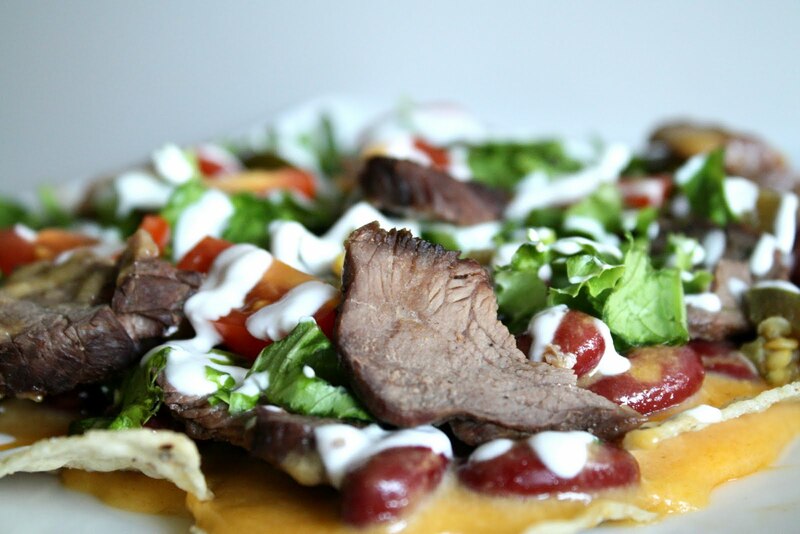 They layer thick, manly sized slices of smoked steak on mounds of crispy tortilla chips and gooey cheese. 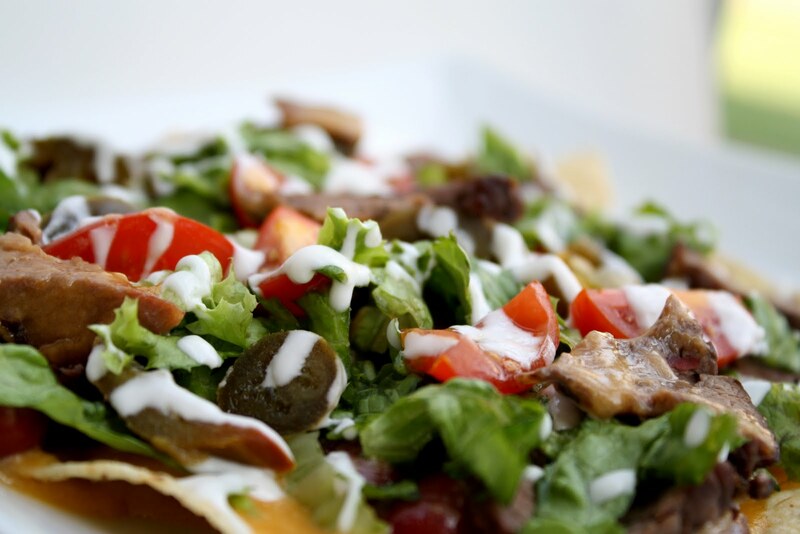 Topped with lettuce, tomato, sour cream, guacamole, and jalapenos, they are a definite appetite crusher. Since I acquired some leftover steaks from my husbands birthday dinner at the in-laws, I decided to slice them up and make my own steak nachos for dinner. I was feeling a little adventuresome and made a cheese sauce to pour over them, instead of plain shredded cheese, which turned out very tasty. Since the cheese sauce is more liquid in consistency, you have to be careful not to pour too much and make the chips soggy - which I did - but they were good nonetheless. Heat oven to 350F. Place tortilla chips on a baking sheet, and put in the oven to warm up. In the meantime: In a measuring cup, add the milk, beaten eggs, salt, and pepper. Over medium heat, pour the mixture into a medium sized saucepan and add the shredded cheese. Cook and stir until the cheese is melted. Add the cumin and kidney beans, stir to combine. Cook until the cheese sauce is hot all the way through. Remove the chips from the oven, and pour some of the cheese sauce over the tortilla chips. Don't pour too much, or the chips will get soggy. Layer the sliced steak over the cheese sauce. Sprinkle shredded lettuce and tomatoes over the steak. Drizzle some sour cream over the top of everything. Serve immediately and enjoy! 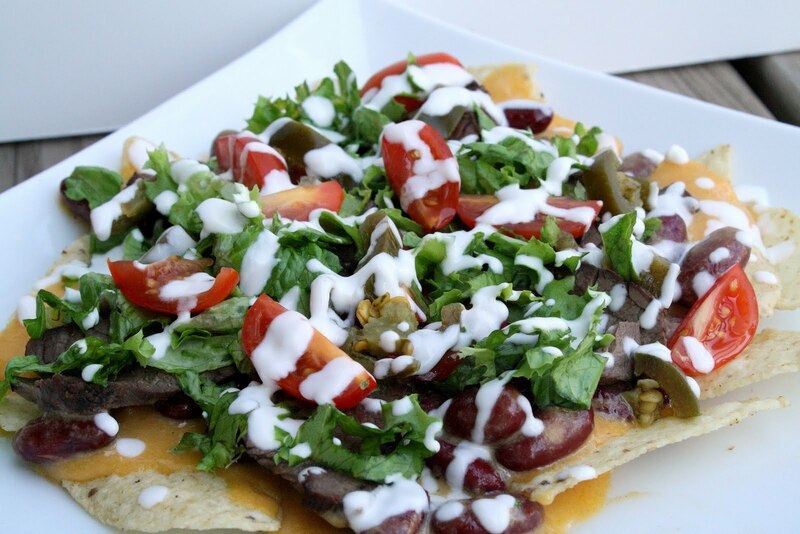 Those are some great looking nachos. My whole family would happily gobble them up. Love the addition of kidney beans!